Pentad Hydraulic 760/5 Gang Mowers units are available as either the Titan, with 6 or 8 bladed 250mm diameter cutting cylinders on a fixed head, or the Fairway, which has 4, 6 or 9 bladed, 197mm diameter, cylinders on a floating head. 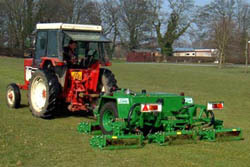 The units are arranged on a trailer so that the leading pair cut the grass in front of the road wheels. A control box in the towing vehicle houses all operation functions. The trailer wheels are fitted with low pressure tyres to reduce ground marking in soft conditions and have braking systems and towing coupling to EEC regulations.